Do you believe fairies are real? We certainly do, and we know that they have some fantastic wins waiting for you to claim in Pixie Wings! This imaginative game was put together by the sharp minds at Pragmatic Play and is available for you to play right now at Slot Shack! You will be wowed from the moment you first launch this game, we are certain of it. Pragmatic Play is known for producing stunning games and this beauty is no different. The background places us in a calm fairy glade and the light shifts slightly between the base game and the free spins; giving the game an air of mystery. The lower-paying symbols might be familiar to you if you have played a slot or two before, since Pragmatic Play has chosen the run of 10, J, Q, K, and A. These have still been given a little redesign to help them fit into the overall flair of the game. Higher paying symbols include 4 wonderfully designed Pixies in yellow, pink, blue, and green. There is also a Wild with the game’s logo and a tree bonus spins scatter. Everything you need to play the game is at the bottom of the screen. Your bet is adjusted using the controls on either side of the spin; a pop-up allows you to select both the coins per line and the coin value to give you full control over how much you are choosing to bet. Underneath the spin, you will find all of the game’s autoplay features. Autoplay is a fantastic function for slots as it allows you to play multiple rounds at the push of a button all while still remaining in control of the game. In Pixie Wings, not only can you select the numbers of spins you want up to a maximum of one hundred, but you can also put in place a number of parameters to cancel the spins if you need to. Wins are awarded when at least 3 low paying symbols or 2 Pixies fall from left to right across the reels along any of the 50 paylines. More information about these paylines and the game’s other features can be found by viewing the paytable on the left of the game. Pixie Wings features an amazing little feature called stacked symbols. This means that the symbols will frequently appear in one big long line on the reels; making it even easier for you to nab some great wins. These stacked symbols really come into their own in the game’s free spins. To activate the free spins, you need 3 of the tree bonus scatters. You will then get to choose which symbol you want to stack during the bonus spins and how many spins you want to receive. You can choose from the King and 5 spins, the Queen and 7 spins, the Prince with 9 spins, or the Princess and 11 spins. You can also choose the mystery option which will select one of the Pixies or the Wild at random, as well as 3 to 12 free spins. With a little luck, you will manage to land some seriously big wins here. 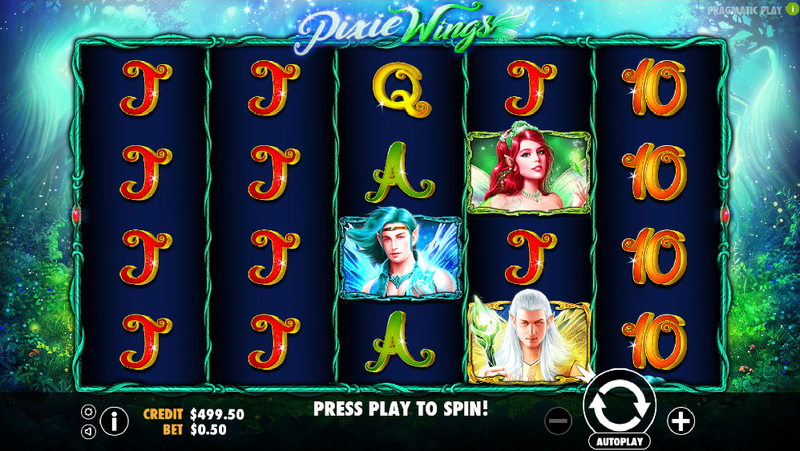 Overall, Pixie Wings is a beautiful game with some great chances for you to land some amazing wins. Head off on your own Pixie adventure today!